With the help of thermal imagers problem areas are detected, which remain hidden to the naked eye. This allows fast reliable and accurate diagnoses of all create problems that can occur in the construction industry. The infrared cameras to show where it is damp or dry and areas that collect condensation that can lead to mold growth are revealed. In addition, points can be detected by the temperature factor, which are not sufficiently isolated. 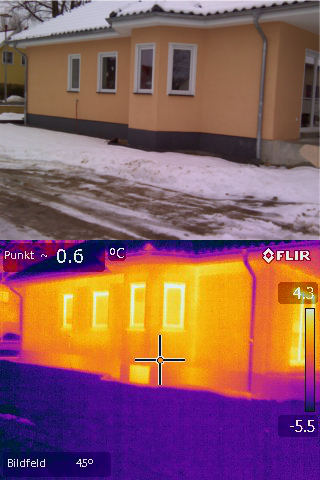 Image: Infrared image of a houseAir escapes from the building or a cold air from outside penetrates. The reason is often poor planning and / or execution. The thermography makes it possible to recognize the very difficult visible airways quickly, detect and rectify the problem areas. Air leaks comfort and reduce the cost of inefficient heating energy and money. Inadequate insulation of windows or doors, wall openings and leaks in chimneys or attics can be up to 50% of the total energy demand for temperature control in a building. Testing the air tightness and thermographic inspections are important points to ensure quality in the renovation of old houses and buildings, as well as in compliance with the current building regulations for new buildings. Infrared thermography provides a safe, direct and cost-effective way to evaluate the operational integrity of a building in the government buildings. With the infrared technology can easily be many problems in the border area reveal that remain undetected in indirect inspections usually. As part of the maintenance himself thermal images to allow investigation of the building envelope and the energy loss easily and inexpensively capture. The measurement data can be conveniently presented in report form for a final inspection report. To optimize the energy efficiency of a building or house, it is necessary to examine the entire building and put problems in heating, ventilation and air conditioning systems, building envelope and duct system in conjunction. The deterioration of the indoor climate may be an inadequate insulation, leaky windows and doors, poor or faulty sealed pipes, leaking pipes or other installation problems that are associated with the heating, ventilation and air conditioning, recycled. Moisture in building envelopes due to leaks or condensation can have serious consequences. Whether after a moisture, mold or fire damage, infrared images with these problem areas can be made visible. Because for remediation are complete and accurate information especially valuable for insurance claims for damages to edit, you can renovate their buildings as a builder and we can provide you reasonable cost estimates and reports. The protection of people, assets and infrastructure infrared cameras are the appropriate means for the early detection of intruders and thus provide more time for you to take countermeasures. The cameras are weather independent and ready for use at any time day or night. Since thermal imaging cameras need no light, even to produce a clear image through smoke, robust and handy models are ideal for fire fighting. So it is possible, even in areas that are heavily contaminated by smoke, and to find ways to orient yourself or to conduct fire fighting from the outside. In addition, the camera also provides valuable information on still hot fire zones in order to prevent spontaneous re-ignition.